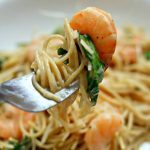 A creamy sauce made with garlic, lemon and parmesan cheese encomapsses thin spaghetti and shrimp. This recipe is cooked in just a few minutes thanks to your electric pressure cooker. Turn your Instant Pot to the saute setting. When it says HOT on the display add in the butter and let it melt. Swirl it around. Add in the garlic cloves and saute for 30 seconds. Add in the chicken broth. Break up the spaghetti to fit into the pot. Add in the spaghetti. It will mostly be submerged in the broth. Cover the pot and secure the lid. Make sure the valve is set to “sealing.” Set the manual/pressure cook button to 3 minutes (high pressure). When the time is up move the valve to “venting.” Open the pot. Turn the pot to the saute setting. Add in the shrimp, salt, pepper, half and half, lemon juice, lemon zest, parmesan cheese and spinach. Stir. Cook until the shrimp are pink and spinach is wilted. If shrimp are not frozen this will only take 2-3 minutes. Season to taste. Serve and enjoy! You can use frozen or thawed shrimp. The frozen shrimp will take a bit more time to turn pink. Make sure the shrimp are deveined and peeled.